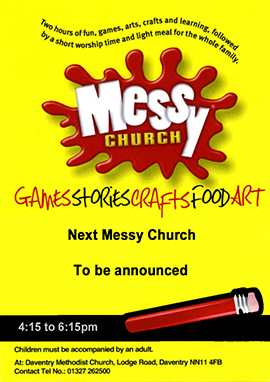 When looking at fresh ways of making church relevant to families who otherwise would find it difficult to joi n our traditional Sunday Services, we were inspired to set up our own Messy Church after seeing what was achieved elsewhere,. 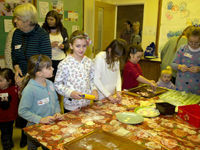 Messy Church began at Daventry Methodist on Friday 11 November 2011 and has not looked back. 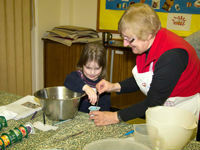 The national organisation of Messy Church has its own website: please click Messy Church to view it. 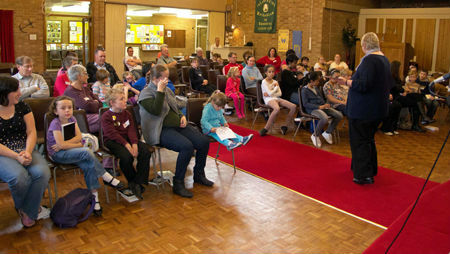 We invite families with children to join us for bible-based fun activities, a short service of Celebration and a meal . Our next meeting is shown above and is announced in the Events page under Church Life a couple of weeks beforehand. If you would like more information please use the Contact page to email the church and one of the Messy Church leaders will reply.